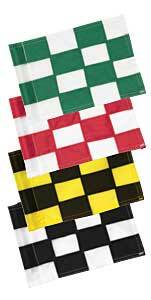 Checkered practice green flags...offers a distinctive look for your course. For a classier, more distinctive look. Available in 1/2 in. size to fit Junior Tournament practice rods and ParAide practice green rods. Overall size tip to tip 6" x 9"